The best part of learning how to applique is that there are several different ways to do it! First lets learn a bit about how an applique pattern works. And then we will show you the traditional way to applique. 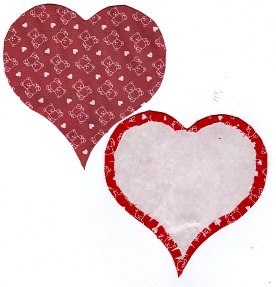 Use simple images cut from a paper pattern that are then applied to a background fabric. Instead of piecing together your design, applique images are placed on top of a background fabric and anchored with webbing such as Heat and Bond, glue stick that is washable, non toxic and acid free, or freezer paper. This is a grid of various anchor links that if clicked on will take you to key areas on this page. Before appliqueing the pieces to the background, prepare the applique pieces by turning under the scant 1/4-inch seam allowance. Care with this step will result in accurate placement for your design. 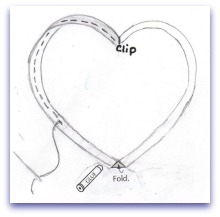 For basic applique instructions when fusing fabrics and cut-out pieces together refer to the manufacturing instructions for using fusible web fabrics such as Aleene's, Wonder-Under, Steam-A-Seam, Heat-n-Bound, etc. Remove the paper from all the fusible web fabric if you are using one that has it. Set up your ironing board or make a work surface. I like to use a folding TV tray that has been fitted with an ironing board cover or a folded white towel on top. Heat your dry iron on a medium heat setting. Use a silk heat setting for Heat-n-Bond. It is assumed that you have already turned under the scant 1/4-inch seam allowances so that your traced lines on your cut-outs do not show; finger press along the lines. Keep your basting stitches near the fold. If one applique piece overlaps another, it is unnecessary to turn under edges that will be covered by other applique pieces. She talks in depth about all the supplies necessary for applique work. 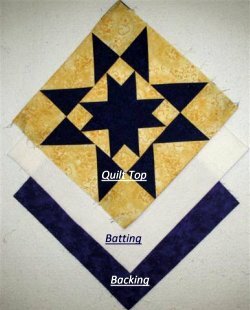 Quilters’ Templar or Mylar are registered trademarks and can help you in learning how to applique. Both terms for this material is Polyester Film or Plastic Sheet and available at JoAnn's Fabric. 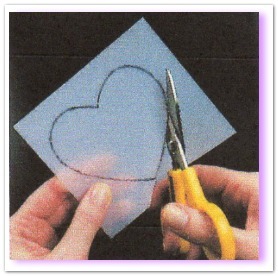 These sheets of clear plastic can be used to create a durable applique template for cutting out pattern images. When compared to freezer paper the plastic sheet is easier to draw around, it holds its shape, and is extremely accurate with repeated usage. This video teaches raw edge applique using a Mylar plastic template. Do not add seam allowances to your Templar shape...only to the applique pieces. Place the cut out Templar shapes on the back of your fabric and trace around the edge of the Templar with a pencil. You don't want the marks to bleed through or visible in any way. Secure the template by applying a bit of pressure with one hand and using a mechanical pencil or chalk pencil (not permanent marker) to trace around the template on the back side of the applique fabric. Notice the 1/4-inch seam allowance is only added to the fabric and not the template. Place the template inside the fabric circle and pull the basting threads to draw the fabric tight around the template. Press the fabric circle with steam. Using your finger nail or wooden presser tool distribute the stitch so that they lay flat. Don't remove basting until shapes are appliqued in place. Remember, if a design is repeated in your project, you only need one plastic template for each individual unique design. For example, if your design requires 4 hearts that are all the same size you only need one template to draw the 4 heart shapes. Valerie Smith's video shows how to make perfect points, convex and concave circles as well as simple turn under seams for a perfectly flat applique piece. Her favorite tools are freezer paper and a glue stick to achieve perfect points when making leaves. Freezer paper has a dull side for marking on, and a shiny side for sticking. When ironed to fabric, the shiny side will stick to fabric and release easily. It can be removed and re-ironed several times before it no longer sticks. When compared to plastic, a paper pattern will lose its adhesive power over time. Using freezer paper is excellent provided you only need to use the template one or two times. Repeated usage will be limited. 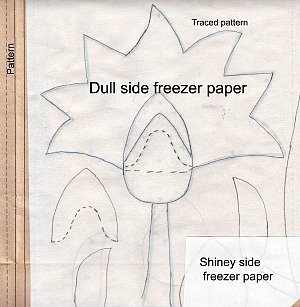 Make freezer-paper templates for applique by tracing the designs directly onto the dull side of the freezer paper. Freeze paper is also transparent and makes it easy to trace the various parts of your pattern. Rolls of freezer paper come eighteen inches wide on a very large roll. This makes it easy to draw your pattern. When learning how to applique you will find pencil works better on paper and permanent marker works best on plastic. Cut out the paper templates on the traced lines so that they are the exact size of the design piece. Do not add seam allowances to the pattern. Freezer paper templates may be used either on front (top) or on the back (bottom) of the applique fabric. When we use it as a stabilizer you baste the applique fabric over the freezer paper edges. For this method, asymmetrical (mirror image) shapes must be traced in reverse. Turn the seam allowance so that it is tight over the edge of the paper and either use a glue stick or starch and finger press raw edge over the freezer paper template for a sharp edge. Ease in any fullness caused by a convex seam or clip seam allowance for a concave seam. Hand stitch the applique in place using the traditional applique stitch making sure the pencil line on the turn under is just out of sight. Move your needle under the applique to grab the fabric and pull it taut so that it is smooth along the edge of the paper. Stop stitching about 3/4-inch from where you began your applique stitches. Remove all basting stitches if any. Remove the paper through the small opening using tweezers and your needle and close the small opening. Another way to remove the freezer paper is to completely stitch the applique to the background fabric. Then make a small cut about an inch, in the background fabric behind the applique. Remove the paper using your tweezers by pulling the paper through the opening. Do not close the opening as it will cause a ridge and may be visible. Place the freezer-paper template with the shiny side facing the right side of the appliqué fabric. Press the freezer paper to the fabric, using a medium hot, dry iron. Let the piece cool before moving. Cut out the fabric applique piece, adding a 1/4-inch seam allowance around the outside edge of the freezer paper. It is the fabric that is the larger and the freezer paper is smaller. To stitch the applique in place with freezer paper on top, simply needle turn the fabric under the paper. Let a small fold of fabric show beyond the edge of the paper for perfect placement of your applique stitches to the background. You use the paper as the guideline for turning under the edges rather than follow a pencil line. With this method on how to applique the paper gives the added benefit of stabilizing the shape while you stitch. After you have finished stitching the applique to the background gently peel off the freezer paper and press. The advantage is that you do not have to cut the background to remove the paper. For this method, trace all shapes onto freezer paper as they appear on the design. Do not trace asymmetrical (mirror images) designs in reverse. I belong to an email group called The Quilt History List. For information on subscribing, visit www.QuiltHistory.com. Lots of topics relating to how to applique and quilt history in general are discussed on this site. Recently someone asked when was freezer paper first used for learning how to applique on a quilt. Hazel Carter, from Virginia, told us that her friend Anne Oliver might have been one of the first to use freezer paper before learning how to applique on her quilts! This is the story Hazel told. “It began with sugar paper". Remember those little wrapped packages of loose sugar? One side of the paper was plastic. Anne used the plastic side of the paper to turn under her seam allowance for applique. The paper wasn’t firm enough, so she and her husband looked for a heavier paper. The search continued until they heard about a wrapping paper used during deer hunting season. Reynolds® was the maker of this product, but it was only, at that time, available during deer hunting season. Today Reynolds® Freezer Paper is readily available in the grocery store, and quilting is even listed on the box as one of the uses for how to applique. 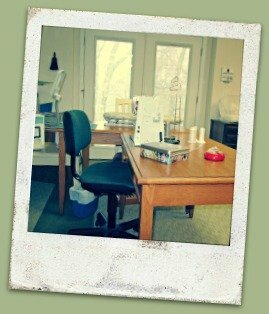 “Anne began teaching for those who wanted to know how to applique using freezer-paper in 1979." 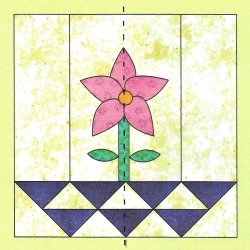 In 1981, an article by Anne on this technique was printed in the magazine Quilt. Anne’s method on learning how to applique involves placing the freezer paper (shiny side up) on the wrong side of the fabric, then using the tip of a hot iron to press the seam allowance to the plastic side of the freezer paper. The fabric adheres to the plastic and can then be appliqued with more design accuracy. 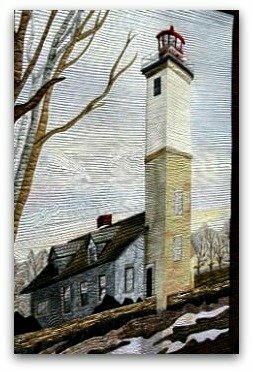 When Anne won awards with her Painted Metal Ceilings quilt (The Twentieth Century’s Best American Quilts, p. 67), she described her “freezer paper design worked.” Today articles about how to applique using freezer paper techniques have been published in nearly thirty magazines. When balance is present in a design such as the single potted flower above, the result is the kind of consistency and stability that we find in some of the world's most notable brands. With a symmetrical design the left side agrees with the right side. To say it another way when the picture is divided directly down the middle both sides are identical or aesthetically pleasing. Symmetrical designs are traced directly from the pattern to the paper. Lay pattern front side up and lay the freezer paper shiny side down on top of pattern. Draw the image(s) using a fine point mechanical pencil for freezer paper or a fine point Pilot pen for plastic. This gives you an identical image of the pattern. Asymmetrical designs, such as the second image above, is characterized by imbalance and disorder...just the opposite of symmetry. If you were to divide the second design directly down the middle you would have two different designs and neither half would tell a story. The left side and the right side are not alike. A asymmetrical design is a mirror image of the pattern piece. 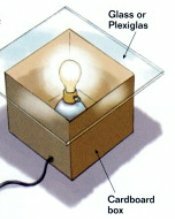 In our second example to trace a mirror image, turn the pattern over (face down) and place on top of light box. Next draw the pattern onto your freezer paper or plastic template. This should give you a reverse image. Don’t have a light box-build your own with items you already have on hand. You're going to love learning how to applique and this box will give you a lot of usage. 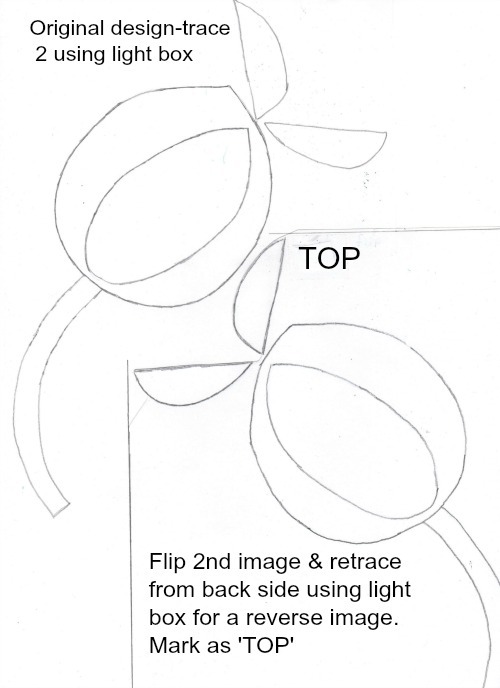 Another way to get a reverse image is to place a piece of tracing (see through) paper over the pattern (right side up) and draw the image on the see through paper. After transferring the image to the tracing paper, turn the tracing paper over and mark it ‘top side’. It helps to have a clear understanding of how fabrics react when cut on the bias. The true bias of a piece of fabric is the 45 degree angle from the lengthwise (selvage edge) and crosswise grains. The bias edge has the most stretch followed by the crosswise edge which only has a slight degree of stretch. The lengthwise grain has no stretch. If possible, place the templates on the applique fabric (not the background fabric) so that the grain runs in the same direction as the background fabric. Why? 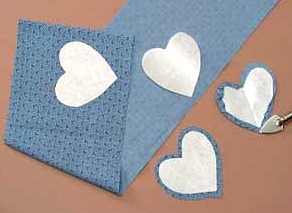 Because you can place the heart template on the bias grain of the fabric to prevent fraying. Designs such as a heart will have inside points. In this case you will clip the crevice just shy of a couple of threads. But if the heart has been cut on the bias you may be able to use your needle to tuck the seam allowance under a bit easier because the fabric will stretch just a smidgen. 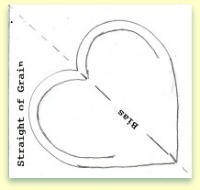 If it is important to center a pre-stamped image such as a small doggie, sail boat, or small baby, and it is not possible to utilize the bias grain rule then simply disregard grain lines. Cutting on the bias makes an outside curve easier to work with. Use small running stitches in the seam allowance around the curve. Tug on the thread to slightly gather the excess fabric so that it will lay flat. For concave seams simply clip seam allowance and ease the fabric around the curves. 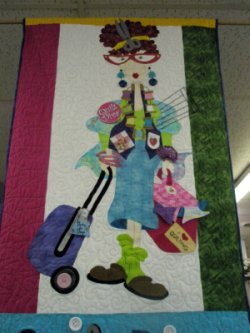 Here is a super great video presented by Barbara @ Flamingo Island Designs labeled "Fusible Applique the Flamingo Way". The pressing sheet is reusable and double-sided. the sheet is made from ultra high temperature glass, coated with non-stick Polylon and comes in a 13-inch X 17-inch to accommodate bigger projects. With the applique pressing sheet you can pre-assemble your design pieces without the aggravation of guessing where each piece overlaps. The transparent construction of the pressing sheet allows you to see your pattern through the sheet to use as a placement guide while you fuse your overlapping design together into one unit. Any time you can reduce your learning curve on how to applique means you have that much more time quilting. Once you have all your pieces assembled gently peel off the entire design from the pressing sheet. The overlapping edges of all the individual pieces are fused to each other but the sticky backing (heat-n-bond, etc.) will not adhere to the pressing sheet. Since the design is now all one piece, instead of several small pieces, you can easily move it around until you are satisfied with its placement. I find that most appliques supplies such as fusible web fabrics such as Aleene's, Wonder-Under, Steam-A-Seam, Heat-n-Bound work well with the applique pressing sheet. 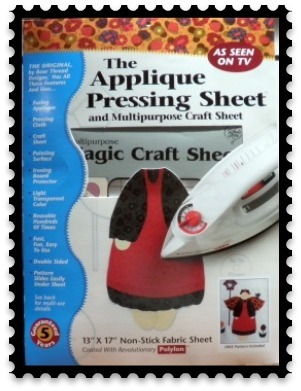 Here we have 'Applique Pressing Sheet Video' provided by Karen Johnson @ Connecting Threads. It is a must watch as she makes it so simple, easy and fast. There are several different techniques for learning how to applique and for preparing your applique quilt patterns. Before appliqueing the pieces to the background, prepare the applique pieces by turning under the 1/4-inch seam allowance. Care with this step will result in accurate placement for your design. You want your work surface to be light in color so you can see the pattern clearly through the applique pressing sheet. Lay your main pattern on your work area. Place the double sided applique pressing sheet on top of the pattern. Place the cut-out pieces, fusing side down one at a time and press to adhere to the applique pressing sheet. Press each piece for 3 to 4 seconds and lift. Do not iron back and forth just press and lift. The applique pressing sheet will hold each piece in place as you continue adding one piece at a time until the entire design has been completed. It is assumed that you have already turned under the 1/4-inch seam allowances so that your traced lines do not show; finger press along the lines. Keep your basting stitches near the fold. Here is a video from the Crafty Gemini...take a look! For me, this is the best way to applique. You don’t need any extra tools. 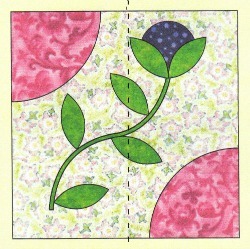 Making an applique border, center square or pot holder are all fun ways to apply your skills. Make a plastic template for your applique shape and trace the design onto the right side of your applique fabric. Cut out the fabric shape, adding a scant ¼-inch seam allowance all around. Turn under the seam allowances, rolling the traced line to the back of the applique piece so it doesn’t show on the front or along the edge of the applique. Baste the seam allowance in place, ( by hand) using light-colored thread. When basting a curve take small running stitches in the seam allowance only; do not baste through the paper and the right side of the applique fabric. Basting stitches need to stay within the seam allowance. Gently pull the thread to gather the fabric and ease it around the curve. As you finish basting the first curve, you will come to the inside point. This is where you will clip the seam being careful to stop about two threads out from the freezer paper edge. When basting the inside point, use smaller basting stitches, but do not force the threads at the point to turn under. These will be pushed under with the tip of the needle as you sew. Tack down the seam allowance edges, taking one stitch down away from the inside point. 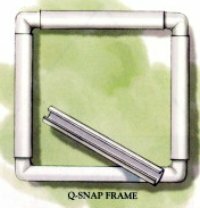 This method will prevent fraying at the inside point. After basting the inside point, baste the second curve at the top of the heart, then overlap the beginning of your basting stitches along the straight edge. Don’t tie a knot; this allows the basting to be removed easily simply by pulling on the thread end. 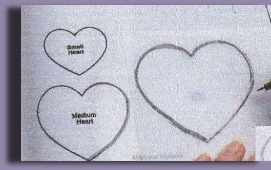 The only basic shape not included in the heart shape is the inside curve. Most inside curves needs to be clipped in several places so that the seam allowance will turn under smoothly. Clip only halfway through the seam allowance to avoid fraying at the edge of the applique. Do not turn under edges that will be covered by other applique pieces. Each of these should lie flat under the applique piece that covers it. Pin or baste the applique to the background fabric. Stitch the applique in place, using the blind stitch or the ladder stitch. This is one of my favorite applique quilt patterns. It has a variety of pieces in which to apply many applique techniques. I picked the pattern up in a shop just outside of New York. It was fun to do and somewhat forgiving. 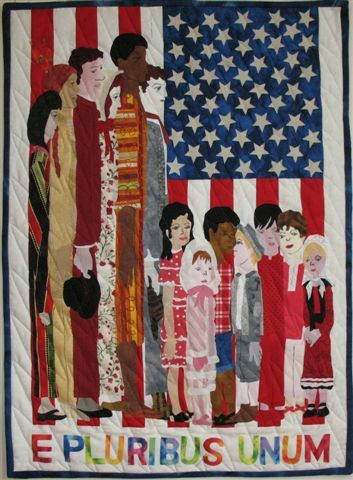 This is an applique quilt pattern we purchased while in New York and have had many requests on where you can find it. Well, we make it easy; simply click on the link and it can be found on Amazon!